What I wore in January of 2018. What I liked and didn't like. Man, is it already the end of January? Is it already 2018? Damn. 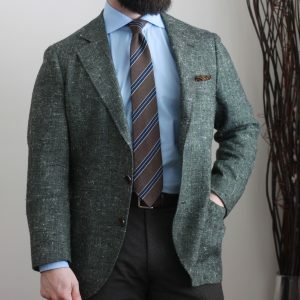 Continuing this series of posts, I’ll take a look back at a number of outfits from the past month of my Instagram posts – a few that I like, and one that I didn’t. Yeah, I seek positive reinforcement even from myself. Anyways, here’s what I wore. This green, slubby fabric is from E. Thomas. It is soft. Like, really soft. It’s a wool, silk, cashmere blend. Spier & Mackay have it here in a completely unstructured construction (say that 3 times fast). It feels like you’re wearing a sweater. Anyways, I paired it here with a pair of brown checked wool trousers, my sharp blue poplin shirt, one of my favourite ties from Vanda, and a wool pocket square from Suit Supply. I like the brown, green and blue colours together. 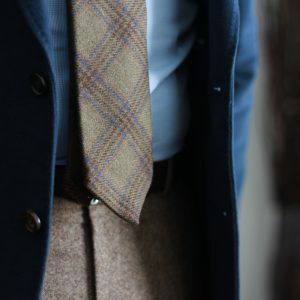 The earthy base colours are set off nicely by the saturated blue shirt, and pulled together and supported by the colours in the tie. 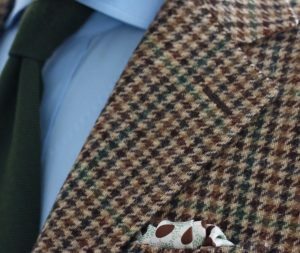 The selection of pocket square was… ok. It’s a bit too much of an orange shade of brown for the relatively subdued browns found elsewhere. I chose it for the darker brown medallions, but looking at it as a photo it seems it wasn’t the best choice. I think the Great Wave square from Kent Wang, folded so that pieces of the boats were showing would be a nicer pairing. 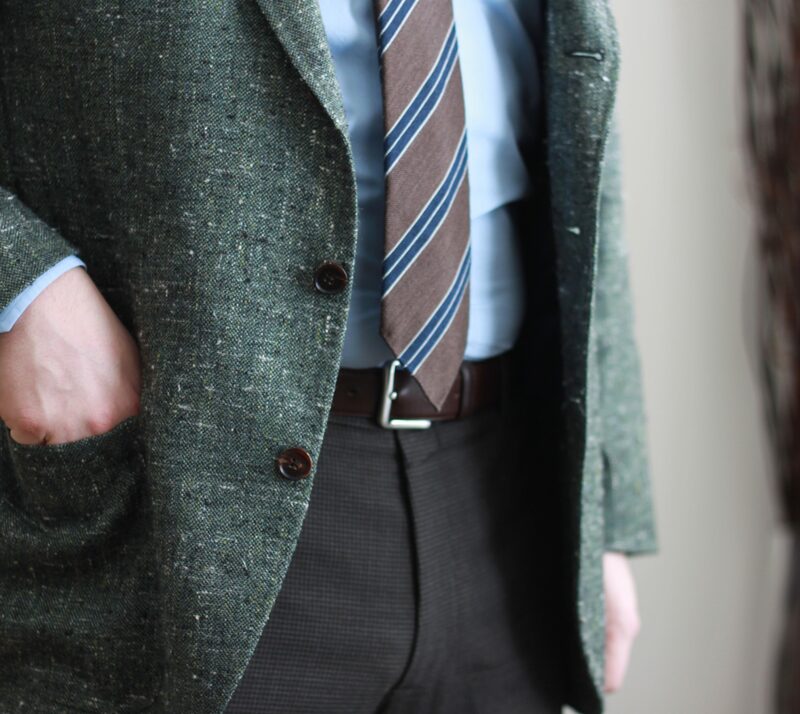 So, navy moleskin jacket seemed the perfect pairing with my light brown merino tweed trousers. 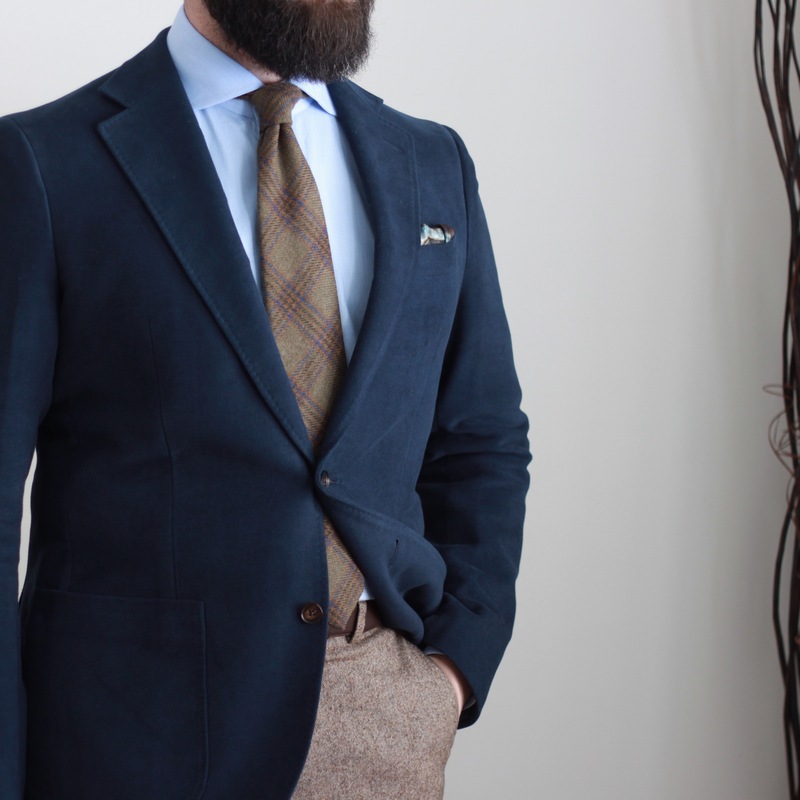 The shirt is a light blue royal twill (I think chambray or light denim would have been awesome here too). 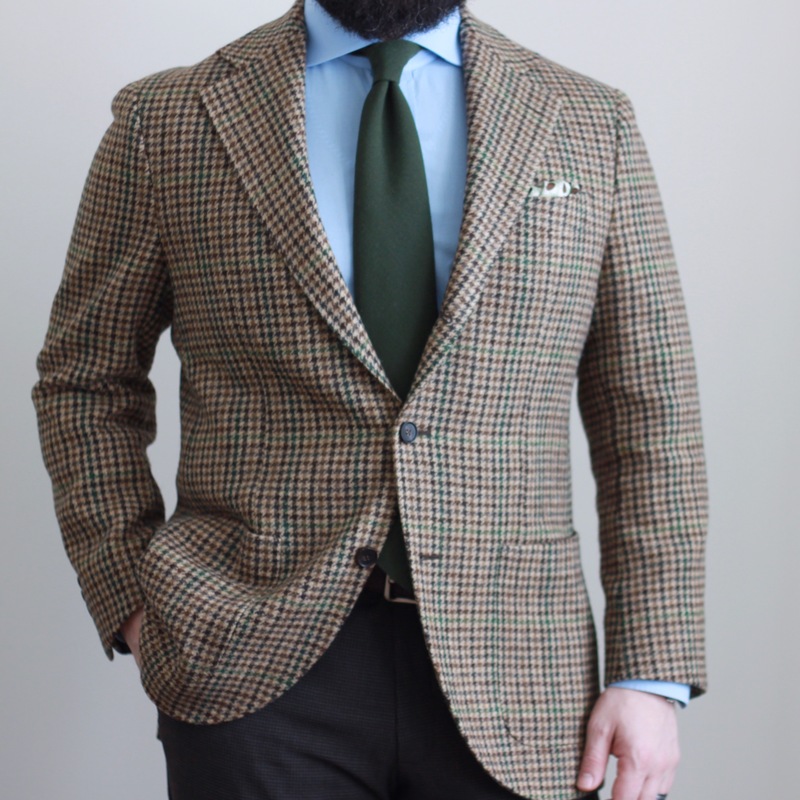 The tie is a Brooks Brothers Makers number I picked up from Luxeswap, and the pocket square is a special one. It’s the commemorative Master Shoemakers square I managed to snag from @Gazman70k on Instagram for winning a contest. Made by Vanda, there are only 41 others in the world. Talk about limited edition! Unseen are my suede wingtips from Velasca to maximize the texture quotient. I’d definitely wear this again. I’m not sure what it is about this outfit that doesn’t quite sit right with me. I like each of the individual pieces, but somehow the sum of the whole was less than the sum of the parts. To my eye the burgundy flannel trousers from Spier & Mackay pair well with the salt and pepper merino tweed jacket, and I love my navy grenadine from Kent Wang, but maybe it wasn’t the best choice here. The shirt is a medium blue micro-houndstooth pattern. I always seem to reach for this pocket square from Vanda when I wear these trousers, and that might be playing too safe trying to pull the burgundy up in some small way. The square is beautiful – burgundy base with a silver, yellow and light blue pattern. Would you wear this? What would you change? 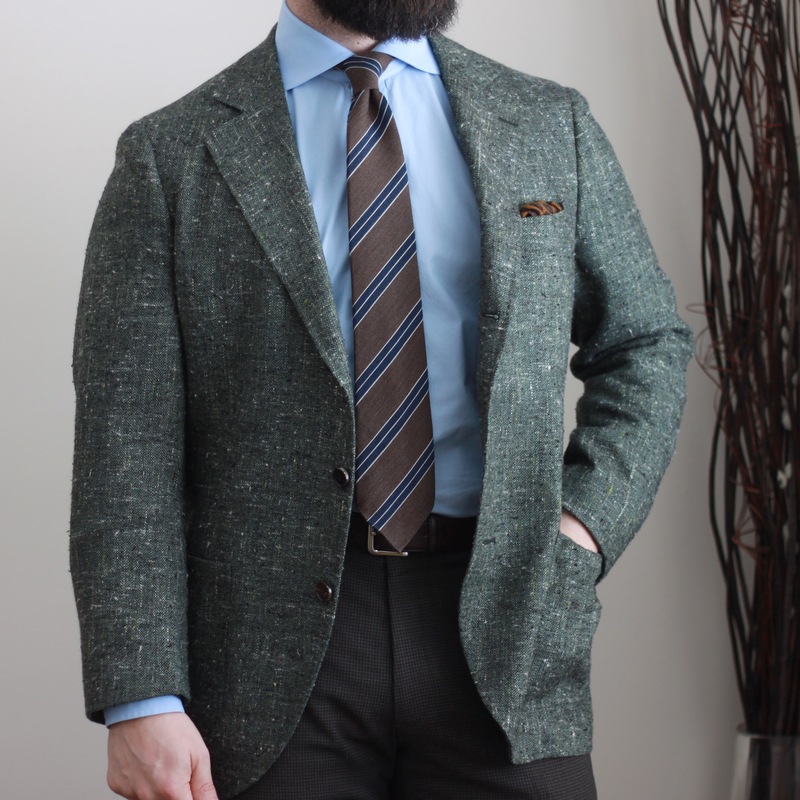 This tweed jacket is f’ing awesome. I pulled the earthy tones as far through the outfit as I could – brown checked trousers, green wool tie, and a Tom Ford pocket square from Luxeswap with brown, cream and greens. 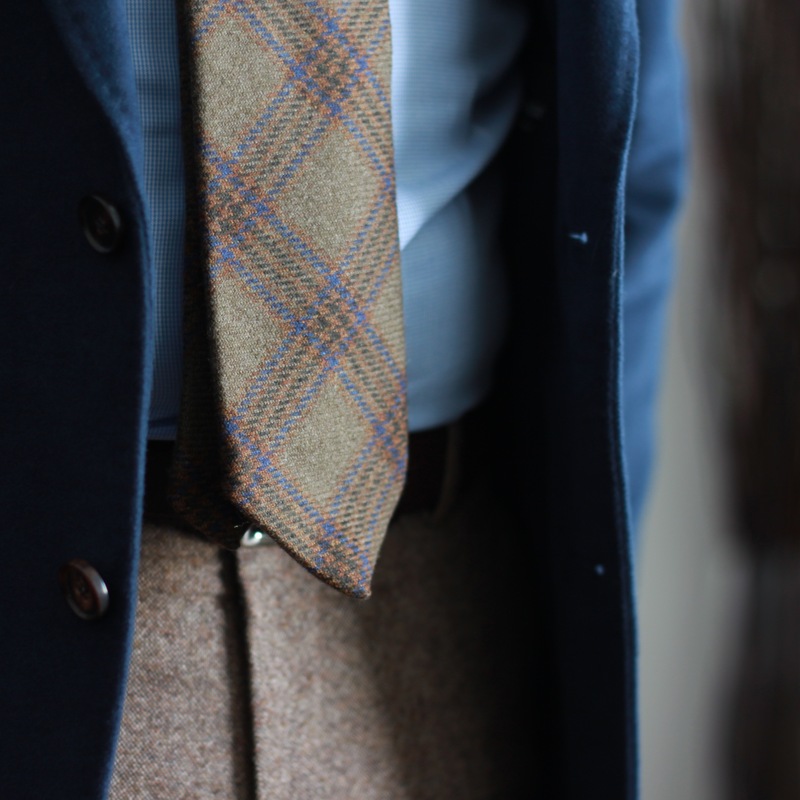 The light blue shirt helps balance out the overall warmth of the outfit. I do think using these colours is a pretty safe play. 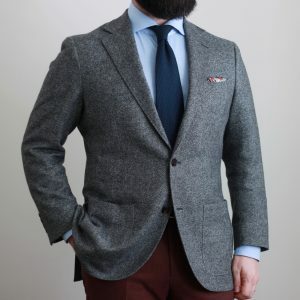 I plan on pairing this jacket with a burgundy or mid-grey tie – burgundy because it would compliment the colours, and grey to pull out the subtler colour in the overcheck. I have an ecru shirt on the way from Spier & Mackay that I think will pair nicely. See you in February with another review of what I wore!